Before receiving support from TechnoServe, Nidia Yescas cooked on a metal drum cut in half over a wood fire. Her kitchen lacked electricity, water and other essentials. Nidia now has a fully equipped kitchen with a gas cooker, appliances, electricity and running water. Before receiving support from TechnoServe, Nidia Yescas cooked on a metal drum cut in half over a wood fire. Her kitchen lacked electricity, water and other essentials. Nidia now has a fully equipped kitchen with a gas cooker, appliances, electricity and running water. When Nidia Yescas lost her husband, she faced an uncertain future. Her family’s livelihood was its plantain farm in Rivas, a rural town in southern Nicaragua. But when Nidia took over the small farm, she knew practically nothing about agriculture. "I listened to what my husband said he would do on the farm, but he managed all of the production,” she says. “My place was inside our small ranch house, where I cooked, cared for the animals and attended to the kids." Nidia’s entrepreneurial spirit prompted her to continue farming plantains after her husband’s death. 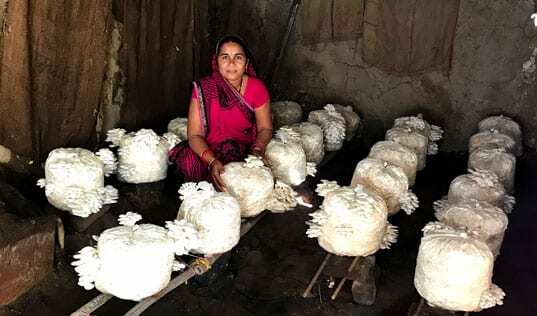 She learned the same traditional agricultural techniques that he had used to earn a living and feed their three children. "What I did was ask the neighbors, relatives and other people who knew what had to be done to produce plantains,” Nidia says. “I remember that first harvest was so hard because I had to work in the field and manage the household chores." In 2007, a TechnoServe business advisor visited Nidia and suggested that she join a project funded by the U.S. Agency for International Development (USAID). This program would give business support to farmers, helping them improve production techniques, access new markets, strengthen their finances and increase farm incomes. "Help is what I was looking for and I received it, thank God, and from that moment things started to change," Nidia says. In order to improve the quality of her plantains, Nidia began to receive assistance from business advisors who showed her best practices for her farm in areas such as pest management and fertilization. Nidia bought sprinkler systems and adopted improved production techniques. She began to use better stocks to replant her trees. The program also helped her obtain financing and partner with other producers in the area. The assistance has helped Nidia improve the farm’s appearance and raise the quality of her plantains – now 90 percent of her crop is grade A. She has increased her production area and improved productivity by 8 percent. Together with her second husband, Nidia is making improvements to her home, feeding her family a better diet and creating a brighter future for her children.